Before contacting the National Map Centre, please look through our Frequently Asked Questions. If you still can’t find what you’re looking for please call us on 01707 268212, email us at info@planningmaps.co.uk or use the CONTACT FORM on this site. If you are you extending your property, carrying out a small building project, installing solar panels or need a plan for exterior signage, you will probably have to apply for planning permission from your local authority. For most property developments getting planning permission is a legal requirement. It's main purpose is to control the impact of buildings on the environment. 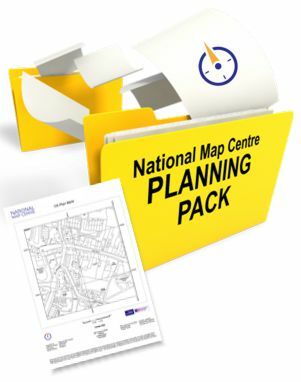 The planning office may require up to six copies, which National Map Centre's Planning Pack can provide quickly and efficiently. You will need to contact the planning officer at your local council to discuss what type of application is required. If you are applying for Full Planning Consent, your application will need to include detailed site location plans showing the extent of your development. If you live in a Conservation Area or in a Listed building, the requirements are more rigorous. Planning officers recommend using the most accurate and authoritative mapping available, such as Location Map. The location of your present site and its boundaries, with the layout of your proposed development. The relationship of your development with the surrounding area. When Land Registry register a property they prepare a title register and a title plan. The plan shows the land owned. Each title plan is stored in their computer system under a title number which is unique to that property. Title plans are prepared using the latest Ordnance Survey mapping available at the time of registration and are not updated as a matter of course. What does your title plan show? the title number of the land. the land included in the title which is normally edged in red. There may be other colours or markings on the plan. The significance of these is explained in the register. the scale at which the plan is drawn. Does the Title Plan show my boundary? the legal boundary - is the line which is not visible on the ground which divides one person's land from another's. It is an exact line having no thickness. It is rarely identified with any precision either on the ground or in the deeds. the physical boundary – is a physical feature such as a fence, wall or a hedge. The legal boundary may be intended to follow the physical boundary, but this is not always the case. For example, the legal boundary may run down the centre of a hedge, along either of its sides, or anywhere within or beyond it. How quickly will I get my OS Planning Maps? Because maps for planning applications have to meet local authority requirements, we prefer to have experts create them for you rather than leave it to a computer, and thereby minimise the risk of rejection. Our OS Planning Maps, therefore, are produced in normal working hours. In office hours despatch is generally between 15 minutes and 90 minutes from receipt, but is always within 24 working hours. Out of hours orders are processed within 2 hours of the start of the next working day. These are sent by 1st class post same day if the order is received by 3pm and always within 24 working hours. We recommend using a recorded delivery service, for your own protection. Please note this policy is only applicable for items purchased from the planningmaps.co.uk web site. How can I print maps at the correct size? Maps provided as A4 will print correctly on most laser and inkjet A4 printers. Please ensure your printer prints at 100% sizing - i.e. not "fit to page" or any scaling, as your map needs to be precisely to scale. You can pay securely online using stripe or PayPal, There is no need for you to have an account as you can use all major credit cards with both systems. What is a Planning Pack?